While Microsoft changed the way users boot into the company's Windows 8 operating system which is a couple of seconds faster on average than in previous systems, it did sacrifice a couple of things along the way. I have already talked about the new boot process and how it saves some information on the hard drive so that the system can boot up faster. While that is great most of the time, it means that some changes that are made to the hardware or software won't be accessible until you perform a regular reboot of the system. Another issue was just discussed on the WinAero website. Windows 8 apparently delays the start of desktop programs that have been added to the start up folder of the system or to one of the auto start Registry locations. These programs are started delayed, usually a couple of seconds after the operating system has been loaded. You may have noticed the behavior on your PC running Windows 8 if you have added programs to the auto start. While the delay does not impact Windows RT devices, as you can't install desktop programs on it that you want to auto start with the system, it may impact desktop users of the operating system. There is a fix though that you can apply to reduce the start up delay that Microsoft has put in place. 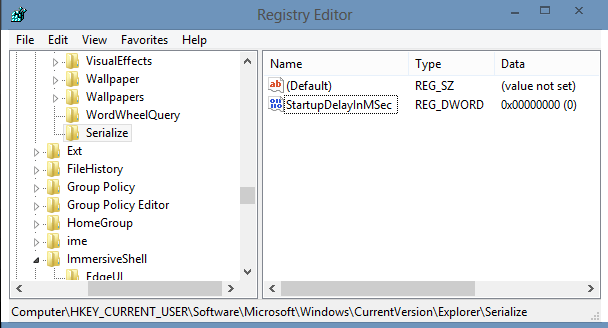 Open the Registry Editor by pressing Windows, typing in regedit and selecting regedit.exe from the selection menu. Make sure you confirm the UAC prompt. If Serialize does not exist create it with a right-click on Explorer and the selection of New > Key. Name it Serialize. Once done right-click the newly created key and select New > Dword (32-bit value) and name it StartupDelayInMSec. Double-click the newly created parameter afterwards and set its value to 0 if it is not already set to 0. You need to reboot the computer afterwards to notice the effect. To do so press Windows-C, click on Settings > Power > Restart. This performs a full restart of the system. The easiest way to open the start up folder is to press Windows-R to open the run box, enter shell:startup and tap on enter. You can then drag and drop shortcuts to the folder to have the programs they link to loaded during system start. Martin, why are you doing these articles on Windows 8 ? Are there so many users ? Even Acer chief has slammed it. Well I use the operating system, that’s probably one of the reasons. Thanks for the tech info !!!! Why do you care? If you don’t use Windows 8, just don’t read the articles. I for one appreciate all the coverage and neat little hacks that Martin is covering. W8 articles are one of the reasons i am here. Thanks for the tip. Even if Windows 8 is not my main system, for obvious reasons (I’m still doing a test) that tip is very useful. I read the article (thank you)…. almost closed the page… then happened to see the comments out of the corner of my eye and took a read. Krishna – You are a fckn cnt! Couldn’t even believe what I was reading and it’s my 1st time here and don’t know any of you. Unless somehow I am mistaken on what your intention was by being such a rude prick… Ohhh I’d hurt you if it were me… and bad. Don’t let that piece of sht bother you Martin – write what you want and about what you want. Who gives a fck what that a\\hole says. Whoa dude calm down, did he kill your ms stock? I applaud Martin’s passion in the IT field and his astounding effort to make the geek world better. @Krishna, the Acer CEO didn’t bash the incapability of the operating system directly, but rather questioned the marketing techniques used by Microsoft to promote the next generation operating system. He has a valid point. Trying to transparently synchronize an operating system across all form factors (laptops, desktops, tablets, phones, etc) is a pretty tough task. Are there any side effects of reducing the delay? I did not notice any on my system. This is unique. I would like to ask. If we add a 0 value, won’t the system get more pressurised at start up. Am I the only one who saw that?